TruDenta® could be the answer for you! How so? Chronic migraines, tension-type headaches, face, jaw and neck pain can be interconnected. The cause could actually be caused by unbalanced forces in your mouth. These forces affect the muscles in these areas, leading to reactionary chemical and nerve responses that result in chronic pain. TruDenta® is clinically proven to assess, evaluate, treat, and relieve head pain. TruDenta® is a drug-free, needle-free and pain-free system that really works! It’s designed to provide long-lasting pain relief. These life-changing, therapeutic treatments have been effective for patients suffering from the painful symptoms of chronic headaches, migraines, TMJ/TMD as well as many other painful conditions. 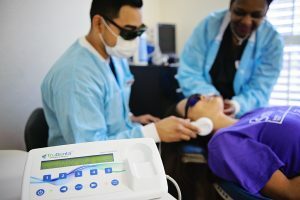 What Should I Expect from a TruDenta® Exam? A computerized measurement of the force balance in your mouth as determined on a tooth-by-tooth basis. A computerized measurement of any muscular disability in the affected area. Panoramic and transcranial x-rays may be needed and/or MRI and Conebeam CT to determine the extent of any joint damage. Through these easy and painless tests, your orthodontist can see the cause behind your headache symptoms. A comprehensive examination helps your orthodontist pinpoint the related areas of mouth health, muscle health, tooth-related issues, as well as any other potential problem areas that will be treated using TruDenta therapy. We use this unique combination of assessment technology and education that frequently leads to immediate symptom resolution for many patients. If you are experiencing any of the above problems contact us today! Our orthodontist will see if this treatment can help you, answer any questions about insurance coverages and provide all the information you need to feel better!